Coming up we’ll hear from Ed Steer of Ed Steer’s Gold & Silver Digest and the Gold Anti-Trust Action Committee. Ed talks about the manipulation in the gold and silver markets, who’s likely behind it, and the explosive moves he believes will occur once it finally comes to an end. Don’t miss my conversation with Ed Steer, coming up after this week’s market update. Well, gold and silver markets attempted to recover this week but didn’t make much progress. Gold is currently posting a 0.6% decline on the week to come in at $1,225 an ounce. Silver is off a slight 0.2% since last Friday’s close to trade at $15.54. Turning to platinum, the beaten down metal is flat for the week as prices check in at $833. Palladium, meanwhile, is making an impressive recovery – up 3.4% this week to trade at $933 an ounce as of this Friday morning recording. Precious metals aren’t capturing much safe-haven buying this month as the U.S. dollar maintains relative strength and stocks trade higher. The broad U.S. averages are on the upswing again this week despite one of the darlings of the technology sector getting pummeled yesterday. Facebook shares crashed 19% Thursday on ugly revenue growth projections. The company’s market capitalization fell by an astonishing $120 billion. To put that in perspective, if $120 billion in wealth evaporated from the precious metals sector, it would be the equivalent of every gold exchange traded fund going to zero… plus every last silver ETF getting completely liquidated… plus Newmont Mining and Barrick Gold – the two largest gold mining companies – going totally bankrupt… plus every Silver Eagle produced by the U.S. Mint in 2018 vanishing from existence. All that devastation would be equal to a 19% drop in a single internet stock, Facebook. That’s just how stretched “FANG” stock valuations have gotten. And just how tiny the precious metals space is by comparison. Gold, silver, and mining stocks aren’t even on the radar of most Wall Street analysts. The sector has been left for dead while “dot com” bubble 2.0 rages. The internet itself is integral to the global economy. But individual internet companies come and go. Even if one as large as Facebook were to go kaput, it wouldn’t take long for it to be replaced by competitors and newcomers. Former Facebook users would simply migrate to alternative platforms, much like Myspace users migrated to Facebook several years ago. It’s not as if Facebook is providing anything that couldn’t be replicated and probably even improved upon by a different social network site. But if gold and silver ceased being mined into production, the world would be deprived of irreplaceable economic assets. Some would argue that the world would be better off without Facebook, Twitter, and Google being so big – big enough to control what gets heard and what can be said online. Political dissidents and even conventional conservatives who believe in gun rights and traditional values are increasingly running afoul of Silicon Valley’s far-left values. Censoring, de-platforming, and shadow banning are constant threats to anyone who wants to share an unapproved opinion. Discrimination against people with alternative opinions has also ramped up in recent years in the establishment financial media. Some of the guests who have appeared on this podcast to share their views have been blacklisted by CNBC. Apparently, dissident opinions about sensitive topics such as the nature of the Federal Reserve and banking system aren’t kosher with NBC executives. Or with the banks, insurance companies, and Wall Street firms that advertise on CNBC. You may not necessarily agree with everything our guest experts have to say. They don’t always agree with each other. Or with us here at Money Metals, for that matter. But we think giving them an uncensored platform to share their thoughts is a good service to the investing public. Investors who seek out a range of news and opinions wider than what’s presented on TV will have a much better perspective on the markets. The Media Research Center has been documenting fake news and liberal media bias for decades. Sometimes the bias is obvious, like when they run anti-Trump hit pieces. Sometimes it’s more subtle, like when newsworthy events are simply not reported. Many important developments in sound money legislation have taken place at the state level in recent months. Yet outside of local media coverage, there has been virtual silence – no national recognition of a sound money movement that has national support and significance. Media Research Center Report: The Wyoming Legislature recently and overwhelmingly passed HB-103, which legalizes the use of gold and silver coin, otherwise known as specie currency, and lifts the taxes on the holding of said cash. And this is a big, big deal for two key reasons. First, it lets people fight the inflation of the money supply inspired by the Federal Reserve, or if the Fed were not doing it, what the U.S. Treasury would do in order to pay off its bills. Unfortunately, Americans who rely on CNBC or CNN for their news won’t ever learn about the origins of the inflation that is steadily eroding their paper wealth. Mike Gleason: It is my privilege now to welcome in Ed Steer of Ed Steer's Gold and Silver Digest. 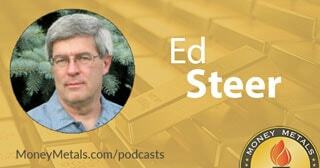 Ed has covered the precious metals markets for going on two decades now, having written for Casey Research prior to his latest project, and is also a director at GATA, the Gold Anti-Trust Action Committee, where he and his colleagues work to expose the manipulation in the gold and silver markets. Ed, it's a pleasure to have you back on, and thanks for the time today. Ed Steer: And thanks for having me on. Mike Gleason: Well, Ed, let's start off by getting your assessment on the gold and silver markets here. Prices fell below some key technical support levels recently but have found some support and have rallied slightly in the past few days, and I should note we're talking here during after-hours trading on Wednesday. But these are trying times for metals investors, Ed, so what are you expecting from the markets in the months ahead? Ed Steer: Well, there's no question these are trying time, especially this last take down since the middle of June. Everybody knows that the precious metals have been basically in the dumpster for the last five or six or eight or ten years, and this final kick in the pants, the down side, has just demoralized everyone. What I think it is, in the technical support lines or whatever they are, is based on technical analysis, and what's going on basically is what Ted Butler has pointed out, is that this is JP Morgan and the commercial traders taking the managed money traders on another financial ride for fun profit and price management purposes. When this is pretty much done to the down side, and it appears that we're done now, Mike, it really looks like the low is in or if not very close to it. Once that is done there is nothing left but blue sky and hopefully that JP Morgan Chase, which has been the big short seller of last resort, they don't step into the next rally and we’re going to be away to the races in pretty short order. Mike Gleason: We aren't too sure why speculators are still willing to enter the gold and silver futures markets given the evidence that they are likely to be cheated. We know that bullion banks, like JP Morgan, have a nice set of tools for fleecing clients and controlling prices, chat rooms for coordinating attacks, high frequency trading set-ups designed to front run trades, the ability to sell essentially unlimited quantities of paper silver to sop up any amount of demand. What we don't see is serious effort to provide honest alternatives. It seems like there would be good demand for an exchange that does a better job of guaranteeing fair treatment. Miners, who are harmed the most by any price suppression that may exist, have legitimate hedging needs and it seems like they would be thrilled to have an alternative, but we aren't aware of any serious movement towards creating something better. Are you and why have we been stuck with such a flawed and fraudulent system of price discovery for the metals for so long? Ed Steer: Well first of all, the CFTC is completely bought out. They will do whatever they are told to do and they are basically told to ignore the price management scheme in the precious metals and the futures market was set up back in 1973 for the express purpose of controlling the price of the precious metals. Until that changes nothing changes. And, of course, the miners know perfectly well what's going on but aren't prepared to do anything and if you think they are being hurt well think of their investors and the countries that are digging this stuff out of the ground, and they are almost all without exception, third world countries, like Central and South America, the African continents and, of course, there is the United States and Canada and Russia and all the other countries that produce, they are all beholden to the empire, which is the United States. They control the prices of all the commodities through the COMEX futures market and until they are dethroned nothing is going to change. Mike Gleason: It just seems amazing that we continue to have people on the other side of the trade. Why do you think it is that the little guy that is going in there, speculating, thinks he can somehow beat these bullion banks? Ed Steer: Well it is certainly possible for the little guys if they know what to look for to do it. It happens all the time. But let me salute (to something) you said before Mike, and that is the fact that a lot of the traders at the banks are fleecing JP Morgan and the other commercials are fleecing, are the brain-dead managed money traders. They trade moving averages only, number one. And secondly they are always playing with other people's money. And the more money that floods into that sector the more they bet and as long as they are prepared to basically be slaves to moving averages the bullion banks know that, especially JP Morgan and they play them for the suckers they are and until the managed money traders smarten up and decide they are not going to lose any more money this game will continue. Mike Gleason: The dollar has obviously been a very big headwind for the metals of late. In a recent article of yours that I was reading you implied that the powers that be are propping up the dollar and coming in to save it right when it's on the verge of potentially breaking to the down side. Give us your thoughts there. Ed Steer: Absolutely. There is no question about it. The dollar index is really a red herring. It’s something that I have never felt was a strong indicator of what bullion prices should be doing. If you go back to January 1, 2016 and look where the dollar was back then and where it is now, gold should be much higher than it is now because the dollar has fallen almost 1,000 basis points since that time and, of course, it is not reflected in the precious metal prices at all. And silver analysist, Ted Butler, had something about it in his weekly commentary that since June 15th the gold price is down X number of dollars and silver price is down X number of dollars but basically the dollar index hasn't changed at all. And from the work that John Hathaway, a couple years back, he found a core relation between the dollar index and the price of gold to be about 0.31, which is basically no core relation at all. So yes, they are propping up the U.S. dollar index so they can do the dirty behind the scenes in some cases. But if they allowed markets to trade fairly there is no question about it, the U.S. dollar index would crash and burn and precious metals would be heading to the moon. Mike Gleason: I want to get your thoughts on Fed policy here. The dollar has been strengthening in recent weeks after collapsing for the first year of Trump's presidency. Last week the president expressed some concerns over the strengthening dollar and had some criticism for Fed officials. So far, however, expectations haven't changed much. Fed watchers are still expecting another couple of rate hikes this year. What are you expecting? Do you think the Fed will be able to stay the course? Ed Steer: I will tell you what, I really don't know the answer to that question. I would expect, if I had to bet $10, that they are probably going to raise rates in September regardless of what Mr. Trump may think. But, as we just eluded to and as with your last question, they are artificially propping up the U.S. dollar index as it is and if they weren't managing the precious metals and the all commodity prices and the COMEX futures market, then the dollar, regardless of what the interest rates would be doing, would be an entirely different value today, along with all the other commodity prices that you see out there today. Mike Gleason: You obviously follow the sector as a whole. How's the mining industry doing? You have to think that these continued price suppression schemes, the low spot prices, especially for silver, granted only about maybe 20 or 30% of all silver mined comes from primary producers but is the industry really going to be suffering here. What are you seeing? Ed Steer: I don't follow the base metals, but all the commodities are down right now and there is no question about it, it is going to hurt the miners and the primary silver producers, and the primary gold producers are feeling the pain. There was a story about South African gold mining in the news, was it yesterday or the day before. The South African mining companies, of course, they are hurting really badly because their cost of production is through the roof and they are not profitable at all but they keep complaining about it but they won't go to the root source and the fact that the price of their product is being managed by a small handful of traders in the COMEX futures market in New York. The bullion banks, like I said before, and I have said for years and years and everybody else has said for years and years, they know what is going on, but they absolutely refuse to help themselves. Mike Gleason: Give us your assessment of silver here, where is the near-term resistance, where is the near term support and what are you looking for on the price charts, say over the intermediate to longer term? What do we need to see hold on the downside and what do we need to see broken through on the upside to really finally get excited about it? Ed Steer: Okay, well I tell you what Mike, I am not a technical analyst, but I will tell you right now if I had to bet the proverbial $10, once again I would say we have seen the bottom or very close to it and how high we go from here is entirely dependent, 100% dependent, on whether JP Morgan is prepared to go short the next precious metals rally in silver, gold, platinum and palladium, because if they’re not, then we are going to see silver prices that are going to frankly shock everybody and it doesn't matter about technical analysis at all. It all depends on whether, like you said before, the prices are controlled in the COMEX futures market and if JP Morgan is prepared to go short then the rallies aren't going to go very far. But if they decide to put their hands in their pockets, well you are going to see a whole new ballgame, regardless of what the technical analysis say. Mike Gleason: How about the PGMs, the platinum group metals? Any comments there on what you are seeing? Obviously platinum continues to just get beaten down. You mentioned South Africa and some of the issues they are having there, of course, that is where a lot of the production comes from. Palladium has struggled a little bit here, although it is still the bright spot in the precious metals space. What about the PGMs? Ed Steer: Well, you can't control the price of gold and silver without controlling the price of platinum and palladium and what I call the big six commodities. The precious four metals, copper, and crude oil. If you can control the prices of those six commodities then the rest of the commodities, more or less, fall into line. And what I said about gold and silver applies exactly to platinum and palladium. If JP Morgan decides they are not going to go short the next rally then we are going to see brand new price prints in both those precious metals as well because the paper market over the last 10, 15, 20 years has totally trumped what supply and demand factors should dictate these metal prices should be selling for. And some day that is going to change and hopefully it is going to be very soon. Mike Gleason: Well, finally any advice for any of the worn out precious metals investor out there who has been very frustrated about what they've been seeing going on, the sideways grinding action, the continual price smashes once we get towards the top end of current trading ranges. What do you have to say to those folks as we begin to close? Ed Steer: Well, all I can say is that at some point it will end and we will all be very happy that it will end but if you haven't invested any money in the precious metals you couldn't find a better time to do it. And, as some of the great investors over the ages have said, the time to invest is when blood is running into the streets and no matter how badly you feel about it, if you do have some money to spend this is the time to do it. Mike Gleason: Very well put, couldn't agree with you more. Well, thanks very much Ed for coming on and sharing your thoughts with us again today. We certainly enjoyed having you back. Now before we let you go here can you give our listeners more information on how they can learn more about this and how they can follow your work? Ed Steer: Sure. Just google my name, Ed Steer. And my website is EdSteerGoldAndSilver.com and they can read the sample column that I have provided for free and they can decide whether my service is worth $100 a year for 200+ columns. Mike Gleason: Well good stuff. We are big fans of yours and big fans of the work that GATA does there, that I know you are a part of and also the information that you put out there at the Gold and Silver Digest, and we look forward to catching up with you again down the road. Thanks for coming on. Enjoy the rest of your summer and also have a good weekend Ed. Ed Steer: Thank you and same to you and your listeners. Mike Gleason: Well that will do it for this week. Thanks again to Ed Steer, director and board member at the Gold Anti-Trust Action Committee and also the purveyor of Ed Steer's Gold and Silver Digest. Again, check out EdSteerGoldAndSilver.com for more information. He publishes a lot of great content there and covers the metals markets very closely. And we highly recommend everyone check that out. And be sure to check back here next Friday for our next weekly Weekly Market Wrap Podcast. Until then, this has been Mike Gleason with Money Metals Exchange. Thanks for listening, and have a great weekend, everybody.